The Warriors, who never trailed, seized a 2-0 lead in the best-of-seven series, which shifts to Cleveland for games three and four on Wednesday and Friday. Stephen Curry #30 of the Golden State Warriors reacts to a play in Game Two of the 2018 NBA Finals against the Cleveland Cavaliers on June 3, 2018 at ORACLE Arena in Oakland, California. Stephen Curry scored 33 points, sinking an NBA Finals record nine 3-pointers in the process, and the Golden State Warriors moved halfway to their third title in four seasons Sunday by beating Cleveland 122-103. "We've got to get that same focus going to Cleveland," Curry said. Curry, a 30-year-old guard, broke the old mark of eight 3-pointers in a finals game set by Ray Allen of Boston in 2010. "To be on top of that 3-point list is pretty special," Curry said. Curry scored 16 points in the fourth quarter, including a 4-point play from a corner 3-pointer and the record breaker from the left side with 3:30 remaining. He finished by shooting 11-of-26 from the floor, 9-of-17 from 3-point range, with seven rebounds and eight assists. Kevin Durant added 26 points, Klay Thompson had 20 and JaVale McGee added 12 to spark the Warriors. Cavaliers superstar LeBron James netted 29 points with 13 assists and nine rebounds while Kevin Love added 22 points and 10 rebounds, but Cleveland came no closer than five points in the second half. The Cavaliers and Warriors are meeting for the fourth consecutive NBA Finals, with Golden State having won titles in 2015 and 2017 while Cleveland captured the 2016 crown, rallying from a 3-1 deficit in the greatest comeback in finals history. After an overtime opener loss James called one of the worst defeats of his career, the Cavaliers couldn't play Golden State as close, Curry and his teammates thwarting every threat. Cavs guard J.R. Smith, whose late-game blunder in the opener denied Cleveland a potential winning shot, was greeted with a standing ovation by Warriors fans and chants of "M-V-P" when he went to the free throw line. Smith went 2-of-9 from the floor and scored only five points. Cleveland pulled within five points three times in the third quarter but the Warriors carried a 90-80 lead after three quarters. James opened the fourth quarter with a 3-pointer but Curry followed with back-to-back 3-pointers for a 96-83 Warriors edge. 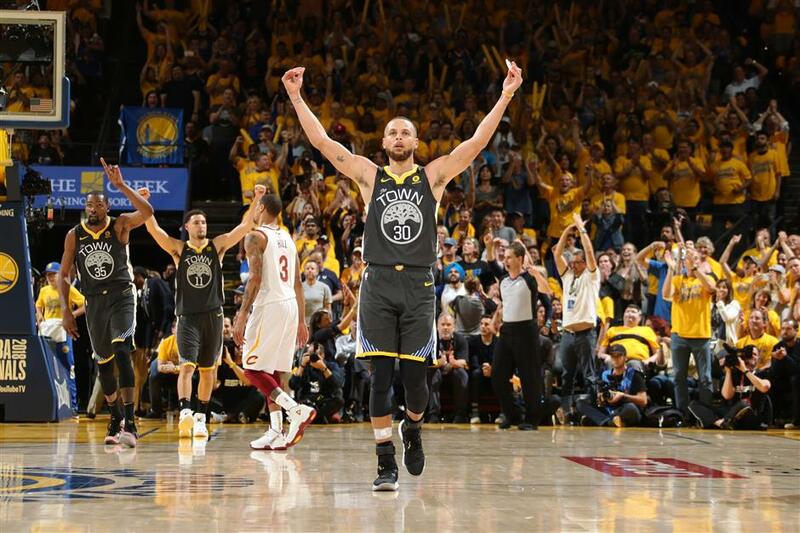 Curry followed soon after with his seventh 3-pointer of the game, a desperation heave with the shot clock expiring, to give the Warriors a 103-89 advantage and the rout was on. Three 3-pointers by Curry sparked a 19-8 Warriors second-quarter run as Golden State took a 59-46 halftime edge. Curry had 16 points, five rebounds and six assists in the first half, when the Warriors shot 59 percent from the floor and passed out 18 assists. James produced 15 first-half points on 5-of-11 shooting with seven rebounds and eight assists.